Cardinal Jorge Mario Bergoglio and Argentina's "Dirty War"
Archbishop Vigano’s statements (which remain to be fully corroborated) directed against Pope Francis pertain to a pattern of alleged abuse (including pedophilia) committed within the Catholic Church to which Pope Francis had casually “turned a blind eye”. But there is “More than Meets the Eye”. Who Was Jorge Mario Bergoglio before he became Pope? Prior to his election by the papal conclave, the role of Jorge Maria Bergoglio in Argentina’s “Dirty War” was known and documented. It was known to the US State Department. It must have been known to one or more of the 115 “Cardinal Electors” of the Papal Conclave which convened at the Sistine Chapel on March 12, 2013. Needless to say, both the Catholic Hierarchy and the international community turned a blind eye. And the media through “omission” has remained silent. Jorge Mario Bergoglio not only supported the military dictatorship, he also played a direct and complicit role in the “Dirty War” (la guerra sucia”) in liaison with the military Junta headed by General Jorge Videla, leading to the arrest, imprisonment, torture and disappearance of progressive Catholic priests and laymen who were opposed to Argentina’s military rule. In a bitter irony, the two priests sent to the torture chamber were committed to the Theology of Liberation against which Bergoglio at the time was firmly opposed. Lest we forget, shortly after his investiture in March 2013, Pope Francis was described by the British media of having brought “Liberation Theology into the Vatican”, in the footsteps of Francis of Assisi. That was a nonsensical statement (“fake news”): In 1976, Bergoglio’s intent (in liaison with the military junta) was to crush Liberation Theology. All this was known prior to his investiture. Why was it not revealed to the broader public? Catholics around the World are totally unaware of “Who Was Pope Francis I”, Jorge Mario Bergoglio. The following article was first written in March 2013 following the election of Cardinal Jorge Mario Bergoglio as Pope Francis I by the Vatican conclave. Minor edits were added in May 2013. In 1973, he had been appointed “Provincial” of Argentina for the Society of Jesus. 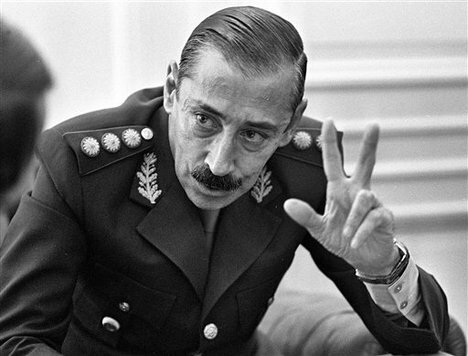 When the military junta relinquished power in 1983, the duly elected president Raúl Alfonsín set up a Truth Commission pertaining to the crimes underlying the “Dirty War” (La Guerra Sucia). 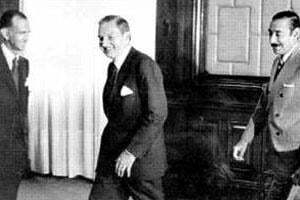 One of the key appointments of the military junta (on the instructions of Wall Street) was the Minister of Economy, Jose Alfredo Martinez de Hoz, a member of Argentina’s business establishment and a close friend of David Rockefeller. The neoliberal macro-economic policy package adopted under Martinez de Hoz was a “carbon copy” of that imposed in October 1973 in Chile by the Pinochet dictatorship under advice from the “Chicago Boys”, following the September 11, 1973 coup d’Etat and the assassination of president Salvador Allende. Wages were immediately frozen by decree. Real purchasing power collapsed by more than 30 percent in the 3 months following the March 24, 1976 military coup. (Author’s estimates, Cordoba, Argentina, July 1976). The Argentinean population was impoverished. Wall Street was firmly behind the military Junta which waged “The Dirty War” on its behalf. In turn, the Catholic Church hierarchy played a central role in sustaining the legitimacy of the military Junta. The Order of Jesus –which represented the Conservative yet most influential faction within the Catholic Church, closely associated with Argentina’s economic elites– was firmly behind the military Junta, against so-called “Leftists” in the Peronista movement. Bergoglio, who at the time was “Provincial” for the Society of Jesus, had ordered the two “Leftist” Jesuit priests and opponents of military rule “to leave their pastoral work” (i.e. they were fired) following divisions within the Society of Jesus regarding the role of the Catholic Church and its relations to the military Junta. 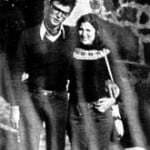 While the two priests Francisco Jalics y Orlando Yorio, kidnapped by the death squads in May 1976 were released five months later. after having been tortured, six other people associated with their parish kidnapped as part of the same operation were “disappeared” (desaparecidos). These included four teachers associated with the parish and two of their husbands. 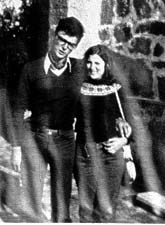 Among those “disappeared” by the death squads were Mónica Candelaria Mignone and María Marta Vázquez Ocampo, respectively daughter of the founder of of the CELS (Centro de Estudios Legales y Sociales) Emilio Mignone and daughter of the president of Madres de Plaza de Mayo, Martha Ocampo de Vázquez. (El Periodista Online, March 2013). 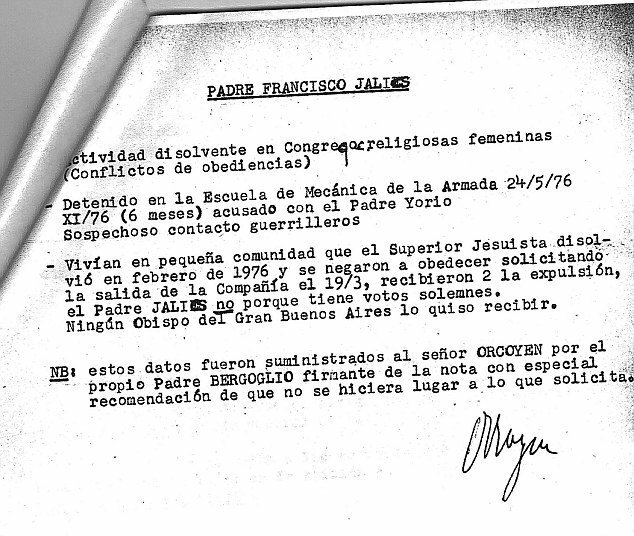 The military government acknowledged in a Secret Memo (see below) that Father Bergoglio had accused the two priests of having established contacts with the guerilleros, and for having disobeyed the orders of the Church hierarchy (Conflictos de obedecencia). It also stated that the Jesuit order had demanded the dissolution of their group and that they had refused to abide by Bergoglio’s instructions. The accusations directed against Bergoglio regarding the two kidnapped Jesuit priests and six members of their parish are but the tip of the iceberg. While Bergoglio was an important figure in the Catholic Church, he was certainly not alone in supporting the Military Junta. “He kept the country’s Catholic hierarchy informed about his regime’s policy of “disappearing” political opponents, and that Catholic leaders offered advice on how to “manage” the policy. 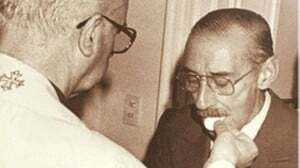 Jorge Videla said he had “many conversations” with Argentina’s primate, Cardinal Raúl Francisco Primatesta, about his regime’s dirty war against left-wing activists. He said there were also conversations with other leading bishops from Argentina’s episcopal conference as well as with the country’s papal nuncio at the time, Pio Laghi. It is worth noting that according to a 1976 statement by Archbishop Adolfo Tortolo, the military would always consult with a member of the Catholic hierarchy in the case of the “arrest” of a grassroots member of the clergy. This statement was made specifically in relation to the two kidnapped Jesuit priests, whose pastoral activities were under the authority of Society of Jesus “provincial” Jorge Mario Bergoglio. (El Periodista Online, March 2013). 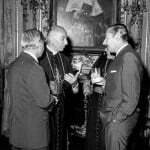 In endorsing the military Junta, the Catholic hierarchy was complicit in torture and mass killings, an estimated “22,000 dead and disappeared, from 1976 to 1978 … Thousands of additional victims were killed between 1978 and 1983 when the military was forced from power.” (National Security Archive, March 23, 2006). Pio Laghi, the Vatican’s apostolic nuncio to Argentina admitted “turning a blind eye” to the torture and massacres. “an interrogation and torture centre in the Naval School of Mechanics, ESMA [close to Buenos Aires], … It was a sophisticated, multi-purpose establishment, vital in the military plan to assassinate an estimated 30,000 “enemies of the state”. … Many thousands of ESMA’s inmates, including, for instance, two French nuns, were routinely tortured mercilessly before being killed or dropped from aircraft into the River Plata. 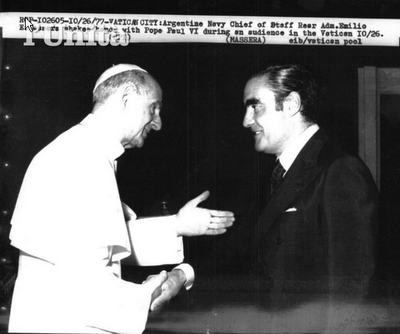 Reports confirm that the Vatican’s representative Pio Laghi and Admiral Emilio Massera were friends. … Soon after the coup, Silva and other church leaders published a declaration condemning and expressing sorrow for the bloodshed. This was a fundamental turning point for many members of the Chilean clergy… The cardinal visited the National Stadium and, shocked by the scale of the government crackdown, instructed his aides to begin collecting information from the thousands flocking to the church for refuge. Jorge Mario Bergoglio was not, in the words of Samantha Power, a “bystander”. He was complicit in extensive crimes against humanity. Neither is Pope Francis “a Man of the People” committed to “helping the poor” in the footsteps of Saint Francis of Assisi, as portrayed in chorus by the Western media mantra. Quite the opposite: his endeavors under the military Junta, consistently targeted progressive members of the Catholic clergy as well as committed human rights activists involved in grassroots anti-poverty programs. The election of Cardinal Bergoglio by the Vatican conclave to serve as Pope Francis I will have immediate repercussions regarding the ongoing “Operation Condor” Trial in Buenos Aires. The Church was involved in supporting the military Junta. This is something which will emerge in the course of the trial proceedings. No doubt, there will be attempts to obfuscate the role of the Catholic hierarchy and the newly appointed Pope Francis I, who served as head of Argentina’s Jesuit order during the military dictatorship. Jorge Mario Bergoglio: “Washington’s Pope in the Vatican”? The Catholic hierarchy in Argentina supported the military government. The Junta’s program of torture, assassinations and ‘disappearances” of thousands of political opponents was coordinated and supported by Washington under the CIA’s “Operation Condor”. Wall Street’s interests were sustained through Jose Alfredo Martinez de Hoz’ office at the Ministry of Economy. 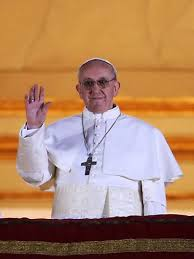 In Latin America, where a number of governments are now challenging US hegemony, one would expect –given Bergoglio’s track record– that the new Pontiff Francis I as leader of the Catholic Church, will play de facto, a discrete “undercover” political role on behalf of Washington. 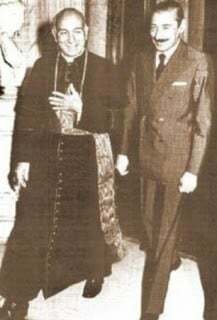 With Jorge Bergoglio, Pope Francis I in the Vatican –who faithfully served US interests in the heyday of General Jorge Videla and Admiral Emilio Massera– the hierarchy of the Catholic Church in Latin America can once again be effectively manipulated to undermine “progressive” (Leftist) governments, not only in Argentina (in relation to the government of Cristina Kirschner) but throughout the entire region, including Venezuela, Ecuador and Bolivia. The instatement of “a pro-US pope” occurred a week following the death of president Hugo Chavez. The US State Department routinely pressures members of the United Nations Security Council with a view to influencing the vote pertaining to Security Council resolutions. Firmly committed to serving US foreign policy interests in Latin America, Jorge Mario Bergoglio was Washington’s preferred candidate. From the outset of the military regime in 1976, I was Visiting Professor at the Social Policy Institute of the Universidad Nacional de Cordoba, Argentina. My major research focus at the time was to investigate the social impacts of the deadly macroeconomic reforms adopted by the military Junta. I was teaching at the University of Cordoba during the initial wave of assassinations which also targeted progressive grassroots members of the Catholic clergy. The Northern industrial city of Cordoba was the center of the resistance movement. I witnessed how the Catholic hierarchy actively and routinely supported the military junta, creating an atmosphere of intimidation and fear throughout the country. The general feeling at the time was that Argentinians had been betrayed by the upper echelons of the Catholic Church. Three years earlier, at the time of Chile’s September 11, 1973 military coup, leading to the overthrow of the Popular Unity government of Salvador Allende, I was Visiting Professor at the Institute of Economics, Catholic University of Chile, Santiago de Chile. 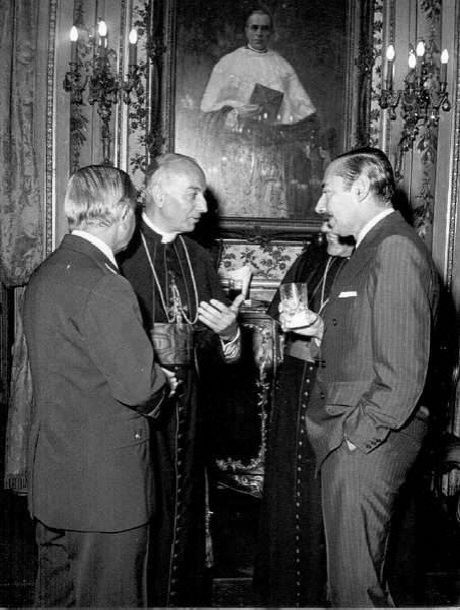 In the immediate wake of the coup in Chile, I witnessed how the Cardinal of Santiago, Raul Silva Henriquez –acting on behalf of the Catholic Church– courageously confronted the military dictatorship of general Augusto Pinochet. THE VΑTΙCAN DOESΝ'T WANT ΥOU TO SΕΕ THIS VIDEO - ΒΙGGESΤ SECREΤ REVEALED!